/ Modified aug 9, 2012 5:35 p.m. 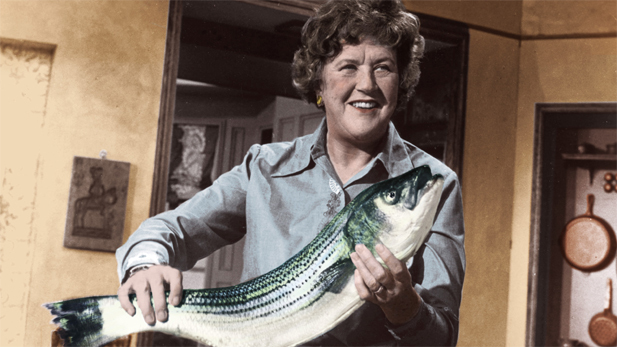 The pioneering - and endearing - television chef Julia Child would have been 100 years old on August 15th, 2012. 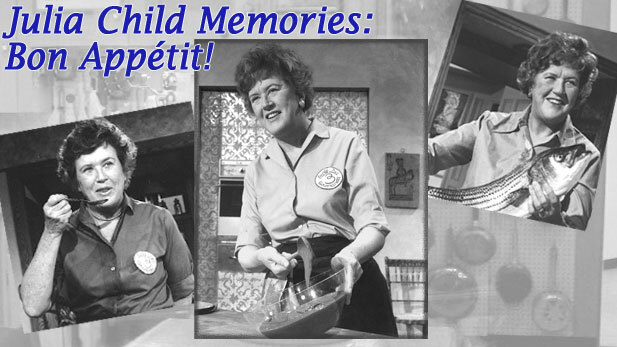 Julia Child is August's "Chef of the Month" on Ready TV, with mini-marathons airing every Sunday. On August 15, enjoy some rare episodes starting at 5 pm on ReadyTV, with an encore on PBS 6 at 1 pm on Wednesday, August 22nd. You can find a complete schedule, plus recipes, video and information on how to attend a Julia Child-inspired cooking demonstration here. You can just imagine how excited I was to be asked to assist Julia Child in November 1981. She was doing five demonstration classes at Le Cordon Rouge, a cooking school then located in San Rafael, California. I was delighted to be asked because I had always looked up to Julia and now I literally had the chance to look up at her. She was very tall!! I had “cut my teeth” on Mastering the Art of French Cooking in the 60’s. Because of the education received through Julia’s book I proceeded to follow a bit in her footsteps. I went to the Le Cordon Bleu in Paris and then branched out from law office work into teaching cooking. Back to Le Cordon Rouge. Julia was 69 years old at the time and had no shortage of energy and stamina. She taught 2 classes a day for 2 days and then one class the third day. She was incredibly organized, along with a good assistant’s help, I might add. The classroom held about 45 people and they were the most respectable students one could teach. Polite whispering was heard once in awhile and many questions were asked of Julia. And, of course, as Julia has always said: there are no stupid questions. She did not teach exclusively out of Mastering the Art of French Cooking since, by this time, she had authored several cookbooks. Here are a sampling of several recipes she taught: Choucroute a L’Alsacienne (Sauerkraut with meats and potatoes); Poulet Saute’ Marengo (Chicken with tomatoes, mushrooms, shrimp,olives, etc. ); Reine de Saba (her famous Chocolate and almond cake); Rognons de Veau a La Moutarde (Veal kidneys in mustard sauce) and Charlotte aux Pommes (a classic French apple dessert). It is the Charlotte aux Pommes and Pain de Mie (French sandwich bread) that bring back some specific memories. Paul, Julia’s husband, was with her. He insisted on sitting in the prime chair directly in front of her in the front row. As much as he was very liked, I’m sure there was a paying student or two who would have preferred him to sit in the back. But he seemed there on purpose. In fact, he put a paper sign on his chair marked “reserved” so that no one would “accidentally” sit there during the next classes. He also proceeded during most of the classes to doze off. It tickled me but Julia kept up the chatter and teaching without seemingly to notice. During the Charlotte aux Pommes recipe as Julia was peeling apples, Paul looked to be asleep. But she said something that I cannot specifically remember about slicing the apples and he popped up and said “that’s not right”. I knew after that that he heard every word she said. Another funny happening was when Julia was kneading the bread for the Pain de Mie recipe. Again, remember, I’m “Mutt” and she’s “Jeff” and cooking schools usually have an overhead mirror for better student viewing. Well, part of Julia’s kneading process was to pick the dough up and slap it on the counter. As she did, the dough struck the mirror and left a huge grease spot. The class roared as she looked at me and said “ Maybe I should have had you do that for me”. Julia is truly the wonder woman of food and I doubt anyone will ever take that title away from her. She was always ready to encourage everyone interested in food to be adventurous and to always enjoy that glass of wine. We did enjoy wine in those classes courtesy of her friend Robert Mondavi . And as the students began to taste the food, Julia never failed to end with "Bon Appetit"!! !